The team of Bhavan's Research Center is under the able-leadership of Dr. Sandhya Shrivastava who has been the Co-ordinator of the Center since November 2007. Dr. Shrivastava is an Associate Professor of Microbiology in Bhavan’s College and also a research guide for M.Sc. and Ph.D. students & has guided over 30 dissertation projects and 4 Ph.D. students work under her. 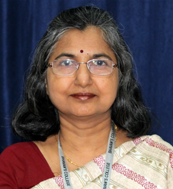 Dr. Shrivastava has been a key member in initiating the establishment of Bhavan’s Research Center as an entrepreneurial venture in partnership with S.P.J.I.M.R.. Apart from her rich teaching experience, she is well recognized by Industry & Government organizations for her expertise in Microbiology, Quality Management System, Designing and Setting up of laboratory, Training and Microbiological Contamination Resolution. She is an active member of Water Quality Association (WQA) and is a member of a technical team of Water Purification System Sectional Committee, of Bureau of Indian Standards, India since May 2011. Bhathena, Z.P., Shrivastava, S., Londhe,and P.,Brown, J. Microbiological performance of novel household water treatment devices in India. Water Science & Technology: Water Supply,2013, 12(2): 343-347. Rohini Nair, Sandhya Shrivastava, Savanta Raut, 2013, Biodegradability of endosulfan in soil and water by microorganisms. S. Shrivastava & K. Soman. 2011 (Jan-Feb). Enzymes in Detergent - Roles & risks. S. Shrivastava, S.F.D’Souza, P.D.Desai. 2008. Production of Indole-3- Acetic Acid by Immobilized Actinomycete (Kitasatospora sp) for Soil Applications. S. Shrivastava & M. Gupta. 2008. Study on diesel degradation by Acinetobacter sp and it’s effect on germination of Medicago sativa. S. Sinha (Shrivastava) & T.R.Doctor. 1983. Quality Survey of Freshly Caught Prawn on the Bombay Coast. Journal: Shipping and Marine Industries Journal. 7(2):72-73.